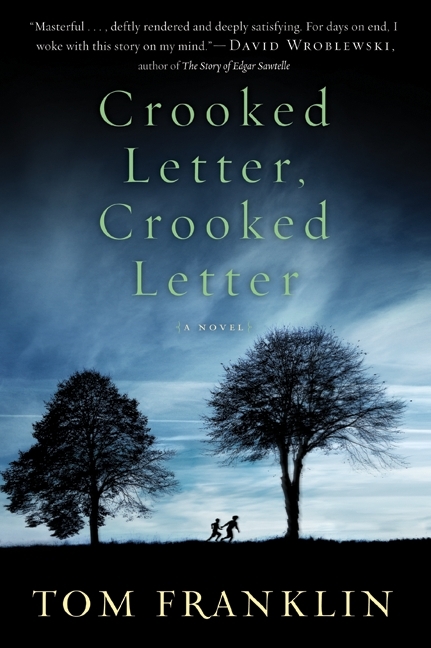 When one of my book clubs chose Crooked Letter, Crooked Letter by Tom Franklin for our next read, I was only mildly thrilled. Until I read it. This novel tells the story of Larry and Silas, two boys who grew up together but apart. Setting the distance between them is race, privilege, and the fact that Cindy Walker is dead. Larry is blamed for her death, as he is the one who was last seen with her; he had taken her on a date which he hoped would finally bring him acceptance by his peers. When she forces him to drop her off so that she can meet her real boyfriend, she never appears at 11:00 that night where they’d agreed he’d pick her up. Her disappearance causes Larry, and consequently his family, to be even more ostracized than before. But this novel is so much more than a mystery, a murder, a plot. Tom Franklin has written of rural Mississippi in a way which made me feel I was there, living it, myself. He creates such characters that they live and breathe off of the page, making my heart ache with compassion for the sorrows and misunderstandings each person endures. Ultimately, it is a tale of friendship. Of brotherhood. Of overcoming wounds inflicted by hate, fear and poverty. It is a powerful, wonderful novel. Find more thoughts here, here, here, here and here. I also loved this novel – glad you did too! Like your review very much (as usual). The book is not available in our Melbourne library so will have to look around for this one. I read this with my book club too. We all loved it and found a lot to discuss. I thought it showed small town America at its worst. I have yet to read one negative review and I'm so intrigued by the premise of the story. I might try this one on audio as I've been rooting around for a good one to start off the year and perhaps this will be my choice. One of my audio favorites this year – glad you enjoyed it, too! I knew it was Mississippi from the title – that's how we learned to spell that long word in grade school. I think I'll put this one on my list. Thanks to the gentle but constant pressure exerted by my reading of you lovely book bloggers, I've decided one of my resolutions for the New Year will be to read a book a week. So – your reviews will be more important to me than ever! I have this book on my Kindle but have not read it as of yet. Thank-you for this great review, I will definitely read it. I liked this one a lot. Glad it worked for you as well. Hope 2012 is a wonderful year for you. I saw this one on sale the other day, and methinks I need to go snap it up if it's still available. I read this gem a year ago and absolutely loved it! I hope to read Franklin's collection of short stories sometime this year. I also hope he's busy writing another novel!